Avocado Sauce for burgers + Seasoned Fries! | "Il faut goûter"
Avocado Sauce for burgers + Seasoned Fries! Burgers and Fries. There’s just something about it. Them. Together. A grilled hamburger is, by default, delicious. Avocado is, by default, delectable. So tonight, Dad grilled burgers (seasoned with Worcestershire, seasoned salt, and black pepper while grilling) and I made a cool green Avocado Sauce for topping. It’s fresh and clean and simply good. It occurs to my dad to heat up the big cast-iron pot full of oil for deep-frying the way you might preheat the oven when it’s time for dinner. We deep-fry quite often, and my mother, whom I will lovingly refer to as a ‘salt fiend,’ has an obsession with french fries. Homemade french fries. She coats them in salt, and at the meal’s end she pulls the salt from the plate with her finger, landing it joyfully in her mouth. I love french fries too, but I prefer to season them a bit more zesty. Tonight Dad braved chilling temperatures to grill burgers and fry our french fries on the porch. I mixed some spices together and seasoned those hot crispy fries right out of the oil. So easy to add a little perk of flavor! I’m happy as a lark this eve, the whole family around the kitchen table (even big brother, home from law school!) chomping on burgers and fries. Don’t be alarmed. It’s perfectly wonderful to get a homemade burger-and-fry fix occasionally. Regularly, even. We’re still healthy and sassy. Mash the avocado in a bowl, then stir everything else in until smooth. 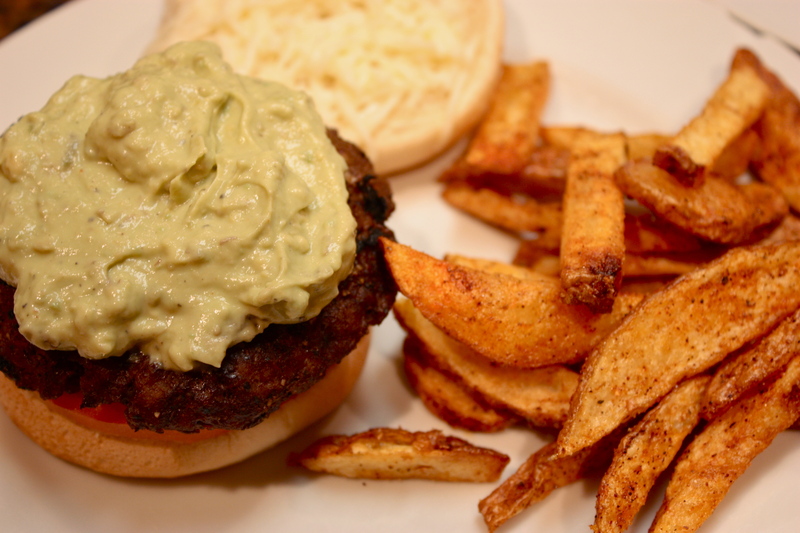 This entry was posted in Savory and tagged avocado sauce for burgers, Cooking, food, french fry seasoning, home, recipe, seasoned fries by needtotaste. Bookmark the permalink. Yes! Only to be made naughtier if I had cooked them in pork fat–I recently read that’s the secret to the Frenchiest Fries. And what isn’t better with pork fat?? Of course, you could go with the Belgian tradition of horse fat (I’ll pass, thanks!) or a nice one that’s popular here in TX steak country, beef fat (I can vouch for that one!). Yes, French Fries certainly bring my family together. Things like Coffee, Sausage Balls, and any sort of cheese also come to mind. Heck, all we do is eat and drink (and be merry). I’m glad to inspire good memories for you! Love the idea of an avocado sauce! I’ll have to try it on something spicy soon 🙂 Thanks for the idea! Love, love, love avocados on burgers. Awesome meal. YUM. I want to eat this RIGHT NOW. It is 10 am where I am. I love the combination of the cool avocado and the zesty fries.